When people think of Rockstar Games, they think of open world titles. The company has made other games, but their work in the genre remains by far their most popular and is what made them matter in the world of games. Personally, I like when their introductions let you experience the world you’re going to spend the next thirty hours in. Red Dead Redemption 1 did this exceptionally well, showing glimpses of the world and hearing conversations from other characters while John Marshton sat in silence. The game then let the player ride a horse to his goal, giving just enough time to experience the landscape without it taking too long, taking around half an hour total then you’re off to do whatever you want in the first area. Perfect! Red Dead Redemption 2 has an introduction that goes on for two whole hours. With a small, limited area to softly encourage the player to focus on missions. Missions which consist of mostly conversations and lengthy horseback rides to get to the objective, with probably fifteen to twenty minutes of total action. Also there’s snow everywhere that ends up making traversal feel slow and tedious both on foot and horseback. On top of that, the game’s dialog was hard to read (I would often get which face button to press confused), which made learning how to play the game all the more annoying. Which in the end defeats the purpose of a good introduction. To be fair, most of the missions I played once the introduction ended were a good time. Yet the ones which fell short did to such a degree that it made me question whether I wanted to keep playing. Would this be a fun mission full of prison heists or robbing a boat? Or would it just consist of me riding somewhere, cutscenes, maybe I shoot a person at some point then wonder the point of that? These were present in the first Red Dead Redemption, yet they were often sprinkled in a way which worked better for the game. They’d teach new mechanics, offer a new area, or something similar. In RDR2, I’d dread heading back to the saloon for a mission because I knew I wasn’t in for a good time. Compound this with how missions can often give annoying consequences such as requiring to get in trouble with the law in ways that have an impact after the mission, and I began losing my patience quicker with each mission that missed the mark. Okay, yes, this is standard in every Rockstar game since GTA IV. But this is a terrible mechanic. It’s tedious, wears on the thumb, and has no business in a sandbox game. I could see a justification in a linear game to make the tense moments where you need to sprint more exciting. Sandbox games, however, require a lot of traversal and many players will naturally want to move as quickly as possible to get to the next area. So the idea of spending dozens of hours having to constantly tap a button to move quickly is not my idea of fun. No, I do not hate riding a horse, it’s part of the Western experience! It’s just Rockstar has made countless choices which resulted in riding a horse being a tedious chore rather than a fun mechanic. First off, you can only call your horse if you’re in a very small radius from its location. Often defeating the purpose of having a button to call your horse. Few things make me want to put down the game more than a mission requiring me to trek for half an hour off my horse because it finishes on another part of the map. To rub extra salt in the wound, your horse stores two handed weapons and a good chunk of your gear. 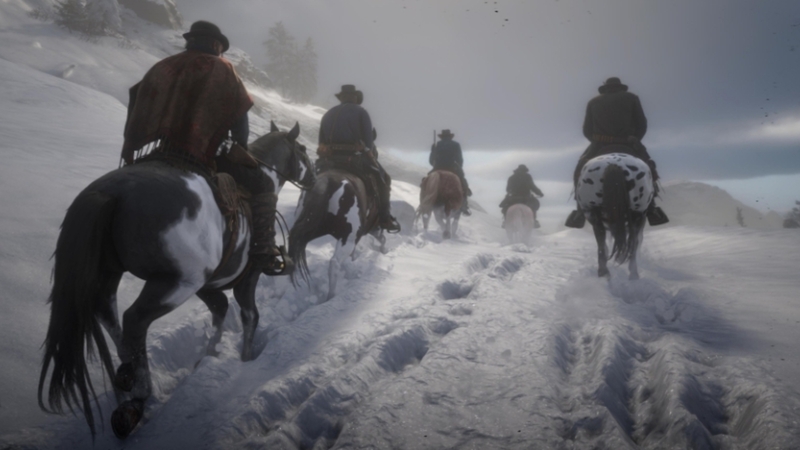 Meaning every single time you want to get a shotgun or rifle, you need to get off your horse, pull it out from there, and then you can be on your way rather than just select it at any time like the last game. I felt like Rockstar took mechanics which were fine in the first game and overcomplicated them for 2, resulting in a less fun experience. Now, I can put up with isolated bad mechanics and design choices depending on how the game incorporates them. Does Breath of the Wild have weapons that are less durable than glass? Sure, but I was always collecting so many that were powerful enough that it felt like an inconvenience. Had the game handed out new weapons sparingly and of low power, it would have been a larger problem. I’ll offer a single scenario which sums up my annoyance with Red Dead Redemption 2 perfectly: I go out on a mission with a younger member of the gang who just went through a bit of trauma. Rather than build a fun way to have him vent during an action packed mission, the two go drinking together. There’s about ten minutes of just the two drinking, which is funny and creative, but not much fun. I’m just wandering around a saloon. So the mission ends and I wake up on the other side of the area from the town where I left my horse. I can’t whistle to get the horse near and it would probably take ten minutes to go back to camp, which is only halfway to my horse. I’m unfamiliar with my location on top of this, as there weren’t any missions to get me accustomed to it. As such, I'm unsure if there would be wild horses nearby or if the town nearby (which is only kind of close) can aid me with this. I quickly get annoyed with how slow my on foot sprinting is, and see a stage coach. Remembering these offered quick travel in the first game, I try to figure out how to get a ride, but am unsure exactly what the text is saying. When I accidentally rob it, the nearby authorities kill me because I didn’t have my rifle or shotgun on hand. When I respawned the horse was next to me for some reason. Ha ha. Yea, that experience at the end there was very similar to one I had. But I kind of enjoyed it, because it caused me to try new things. The horse thing gets better. You can build your relationship with the horse and extend the area it'll respond to you. I think you can hold down the button to sprint too? Or it lets you keep up with someone your following, I think. It didn't bother me too much. I wasn't running all the time anyway. The game is defintely styled more like a simulation game. You have to learn how to do things and overcome hassles like all your important gear being on your horse. Of course, the lesson is, never leave your horse. What cowboy lets himself get separeated from his beloved horse? Ha ha. My one issue is that, after the opening segments, I kind of lost track of the story because I couldn't readily see what to do next. And there is so much to explore and try, I basically forgot about the story as soon as they stopped holding my hand.